Looking to find the best drone, without spending a fortune? The truth is that even when spending 300 dollars on a drone, you could very easily get ripped-off, especially if you buy one from one of the fly-by-night low quality importers. We all want to spend our bucks wisely, getting the best value for our money by buying a durable, efficient and easy to fly drone. To help our readers, I have spent the last few days testing quadcopters, reading user reviews, and have compiled a list of well equipped, bang for your buck drones. If you are in a hurry, here is the top 3 standouts from this review. What should you before buying a drone? So you watched the video above and you still want to buy drone? Good, then we are here to help! In order to get the best bang for your buck, it’s important to be aware of the average specifications and features of the products under such price and category. That’s why we have written a brief summary of what you should expect from such a product. Nowadays, you should expect an average flight time of 12 to 18 minutes. Of course, some brands focus on an increased flight time as a selling factor, while others prioritize other specifications or features. However, any RC flyer on this budget with a flight time under 10 times is considered to be below average. Note: Smaller drones will have a flight time more towards the lower side of this spectrum, mainly due to the power of the battery. Although large drones can also have low flight time due to a high payload. It is one of the most commonly highly prioritized specifications by drone enthusiasts, practically everybody likes to fly far way past eyesight. Nowadays, an average control distance for a product within this price range is considered to be around 200 to 500 meters. However, some brands focus on long-range and manufacture products that can go as far as 1000 meters. Of course, you must expect (and demand) awesome performance from any drone under the $300 price tag. Accurate controls, great capability in flying in windy days and steady hover even without pilot’s input. As technology advances, more features are added to drones as companies compete with each other for sales. Therefore, most under $300 products already come with GPS, Waypoint Flight, Follow Me, Orbit Mode, Headless Mode, Auto-Return, Auto Takeoff and Landing, Low Battery Alarm, Altitude Hold, LED lights and 360º Aerial Stunt. The camera quality of these drones still varies a bit. However, most already come with good quality image cameras and Live Video transmission. You will be able to get some aerial footage and photos that you can proudly share online with your friends and family. Some cameras are even good enough for school projects. On the other hand, most of these drones are powerful enough to carry a GoPro camera, which we strongly advise if you are looking for HD and 4K quality footage. Ok, enough preamble, lets get to our top 10 drones that you can buy for 300 dollars or less. The HS700 from Holy Stone is an upgrade of the extremely popular HS100, a quadcopter to film amateur videos and even film projects for school without spending too much money on a high-end quad. It’s also a good drone for filming outdoor events and even family holidays. It comes with a 12MP camera but also supports the famous GoPro. If you are looking for a drone which is durable, easy to fly, and has all the features you could possibly wish for, look no further. Holy Stone has a great reputation, and this is echoed by the plethora of positive reviews on Amazon. The HS700's learning curve is very small, although it does require some practicing. It is stable and responsive to pilot’s input, exactly how you need a camera drone to perform to enhance filmmaking. The HS700 makes use of brushless motors, which can withstand a lot more milage. Flight time without accessories (guards, landing gear and camera) is 20 minutes. Control range is 400 m, but whats most impressive is the full HD 5G video transmission over this range. The Holy Stone HS 700 comes with a good action camera, which will please most people. It’s a 12MP HD camera with 1080p 30 fps streaming over 400 m. The Live Video can be transmitted to the pilot’s smartphone screen or an FPV monitor (not included). If you want even better image quality, you will be happy to know this quad supports GoPro and other action cameras. We do recommend investing in a GoPro Hero 7 if you are looking for a big upgrade in wide angle videography. In terms of features, HS700 exactly like HS100, it has an onboard GPS module. It empowers smart features including follow me, circle around me, return to home and TapFly. All features are fairly precise and also the GPS locks in approximately 22 satellites in under a minute from starting up. Altitude Hold comes included as welll, but I guess that is logical considering that the presence of GPS. This drone has very similar features to the highly popular MJX Bugs 2W, which sells for less than 200 dollars, but the HS700 outclasses it with superior camera, flight time and range. Editors Award -The HS700 build quality, ease of flying, along with the incredibly positive reviews on Amazon helped it clinch the no.1 spot as our best best drone in the under $300 price range. Explore the world with this easy to carry FPV quadcopter. Comes with a back bag and practically all you need to start your adventure right away! With a 2000-meter (1 mile) control range! Contixo F20 is a great fit for travelers! It’s important to mention Contixo F18 is a beginner-friendly drone. If it’s your first time flying a drone it’s okay to start with F20 due to the GPS assisted hovering. However, this doesn’t mean it’s the best fit for beginners. Although it’s suitable, it does have a slight learning curve. On the other hand, if you already have an intermediate level of expertise you will love F18 performance. Made for travelers and explorers, F20 is smooth and maneuverable, great to carry around with you in the included backpack. It’s equipped with 4 powerful 1806 1800KV brushless motors. Are you ready for some top-notch specs? This is one of the reasons why I personally love this drone. It has a flight time of up to 16 minutes and a control range of 2 km (1.2 miles). Yes, you read that correctly, 2 km! However, we wouldn’t advise beginners to fly that far, even with smart home return feature. The FPV distance however only transmits as far as 500 meters. Of course, a drone aimed at exploring the outdoors must come with a good camera, otherwise wouldn’t make sense. The camera is FULL HD 1080p resolution, enabling great quality aerial footage. It also transmits amazing quality Live Video. You will, however, have to download and install an app (available for Android and iOS) on your smartphone. The remote controller comes with a phone holder where you can place your phone. The Contixo F20 RC is a feature-rich quad and comes with all the functions you need to enhance the whole flight experience. Firstly, it has an advanced GPS assisted hovering, which also enable accurate features such as Auto Return to Home, Smart Return to Home, Failsafe Return to Home and Low Voltage Return to Home. Other more common features are Headless Mode, Altitude Hold, One-Key Takeoff, and Landing. FPV distance is only 500 meters. The famous Parrot Bebop 2. One of the best looking and most fun drones in the market. 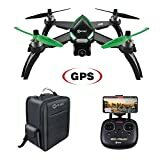 An amazing value for its price, it’s a drone that stands out from all the rest. 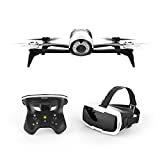 In fact, this drone is usually much more expensive, but there’s an amazing deal online that allows you to buy the drone with only a few accessories (remote control isn’t included, but you can use your phone to pilot it). Thus, earning a place in our Top 10 Best Drones Under $300. Parrot Bebop 2 is one of the most sought drones in the market and one of the reasons is its performance. It’s a very smooth drone, ideal for beginners due to its stable hover (even without pilot’s controller input). If you worry about losing control of the quad, go with Bebop 2, it’s extremely beginner-friendly, even during strong wind conditions. All thanks to the 3-axis digital stabilization system. No wonder it is a bestseller. Ready to be amazed? If you prioritize flight time, I’m happy to inform you Bebop 2 is capable of flying for as long as 25 minutes per battery (on average, it depends on payload and flight conditions). Maximum control range is also amazing, although not as impressive as flight time. Bebop 2 can fly as far as 300 meters. Looking to record amazing aerial videos and take the perfect selfies? Well, Bebop’s fish-eye lens ensures you amaze your friends and your Instagram and Facebook by allowing you to capture all the best moments with a 14MP 1080p built-in camera. It also transmits great quality Live Video to your device’s screen via WiFi; no latency! It supports VR FPV Goggles. Parrot Bebop 2 packs some unique features, unlike any other drone on this list. I’m talking about Digital stabilization, Dual core processor with quad-core GPU, GPS, and Flight Plan (an automated flight planner that uses waypoints to map out your drone’s journey). Unfortunately, Flight Plan is an in-app purchase and doesn’t come free with the drone. Optional Extra: There’s a controller called Parrot Skycontroller (bought separately) that enhances the drone’s range up to 3.1km! Consider buying that extra if you want extreme long range. "Ideal for intermediate to expert pilots, largest drone in this review"
It is one of the bestselling drones under $250 and one of the best rated among drone enthusiasts. HS100G combines a neat set of features with awesome specifications. A drone aimed at the outdoors, HS100G is an incredible aircraft that is both stable and very maneuverable. It’s not an indoor drone, most people use it to film sporting events and their holidays. Some even use it to film marathons. This drone is slightly on the larger side, and will require FAA registration in the USA. If you prioritize a good set of specs, this is the drone to have. HS100G has an amazing flight time of 15-minute per battery (7.4V 2500mAh). Maximum control range is an astonishing 500 meters! Way better specs than most common drones, definitely a must-buy if you like long-range flights. The camera is good quality, films and takes photos in 720p resolution and has a 120º Field of View for a wider angle. The camera’s angle is adjustable, enabling you to move it 90º to acquire different angles of view. This is especially useful for FPV flights. The drone transmits Live Video via 5G Wifi directly to the pilot’s smartphone device through a free to download the app (Android and iOS). HS100 packs a nice seat of features that will surely please most enthusiasts and fans of the outdoors. Firstly, it comes with GPS Auto Return, for an accurate positioning and safe home return. Secondly, it features Follow Me, allowing the drone to follow you as you go (follows your smartphone). Other features: Headless Mode, Altitude Hold, One-Key Takeoff and Landing, Low Battery Auto-Return and 3D VR compatibility. "Ideal for beginner, intermediate and expert pilots"
The UPair One is commonly regarded as the cheap alternative to the DJI Phantom drone series, even the design and the camera resemble DJI’s line. UPair is a beautiful and powerful aircraft equipped with great hardware. UPair One is the cheapest 4K drone we would recommend to our family or friends. It’s very easy to control, even if you are a beginner and this is your first time flying a drone. It hovers steadily without pilot’s controller input, so you haven’t trouble to maneuver it. It will avoid many beginner crashes. The GPS system assists the flight, enhancing the whole experience. Truly feels like you are flying a high-end drone. Powered by a 5400mAh battery, UPair One has an astonishing flight time of up to 19 minutes (if you had more payload, such as a heavier camera it will of course decrease the flight time). The drone’s maximum control range is 2 km, while the Live Video image transmission goes just as far. Don’t worry about losing it, just make sure it’s locked on satellites before you test max range. The UPair One has the specs of a $500 camera drone at the under $300 dollar price range! The ideal drone to record some awesome aerial video and take beautiful photos of your best moments. 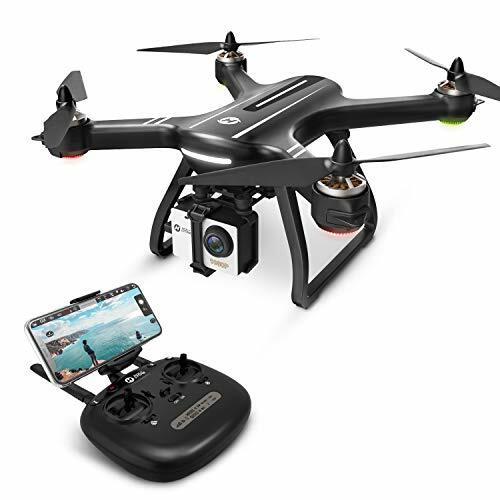 In fact, many customers buy this drone specifically has a cheaper alternative to high-end camera drones, in order to capture outdoor sporting events, holidays, or even a family weekend at the park. The camera is 12MP with 2.7K video. It transmits Live Video to the 7” monitor screen placed on the remote controller. Real-time video is great quality and has no latency! The 2.7k camera is placed on a brushless gimbal that can be adjusted for different angles of view. Love videography and photography? Go with UPair One for an unexpensive aerial photography experience without sacrificing much image quality. The UPair One comes with all the fun and useful features you will need to get the most out of your quad. First of all, it has full GPS lock (able to search and lock on 8 satellites), Position Hold, MicroSD card support (up to 32GB) and Automatic Return. Not the best set of features, but definitely has all you need. "Ideal for intermediate and expert pilots, as well as FPV Racing Beginners"
Ready to start racing? Rodeo 150 was designed by one of the most renowned drone brands on the market, Walkera. The Rodeo 150's aim is to provide a simple and yet powerful, beginner-friendly racing drone to rookie racers. The drone doesn’t require assembly and is ready to start competing! If you are giving your first steps in drone racing and do not have the expertise to build your own custom-made FPV racer, then Rodeo 150 is made for you. It's main selling point: great performance. Capable of competing with all the low-end custom-made racing drones. Rodeo is a must-have to get on the track and start practicing before you move on to more expensive and complex race quads. The Rodeo 150 is powered by a 7.4V 850mAh 30C 2S Lipo battery that provides up to 8 minutes of flight time. If you are serious about racing you will need to buy some extra batteries switch between flights. Of course, every respectable race quad needs a FPV camera to provide the pilot with the vision to properly compete. Rodeo 150 comes with a 600TVL camera, good enough to keep your eyes where it should be, the racing track! You can watch the real-time video on a FPV monitor or FPV Goggles. Besides the WK-WS-17-002 brushless motors (a must in any race quad), and the ESCs, Rodeo doesn’t come with any fancy feature. It does however include the powerful DEVO-RX716 receiver to help you empower your skills. This type of drone is ideal for the fast and furious! "Ideal for intermediate pilots, very stable"
A powerful quadcopter that combines an awesome set of features with awesome specifications. The MJX BW5 Bugs is a widely popular drone and one of the best bangs for your buck! Regarded has having one of the best performances in the market, it is probably the most recommended drone for that particular reason. Equipped with the 6 Axis Gyro system, Bugs 5W is a stable and smooth drone that will ensure many hours of fun. This is where the Bugs 2W shines the most. Powered by a 7.4V 1,800 mAh battery, it has a flight time of around 15 to 18 minutes. The control range is is average, at 300 meters, with FPV distance measuring in at the same. The built-in camera has a 1080p resolution and allows for good quality aerial videos and photos. It also transmits Live Video to the pilot’s smartphone via WiFi. The remote controller comes with a phone holder where you can safely put your phone while watching the real-time video. MJX Bugs 5W doesn’t have many features, comes with the basics but nothing fancy or out of the ordinary (besides the GPS). Its features are: Headless Mode, GPS, Altitude Hold, One-Key Return and LED lights. Control distance is only 300 meters. "Ideal for anyone looking for a cheap FPV drone with goggles"
Manufactured by one of the most renowned brands in the market, Hubsan X4 H501S is the ideal quad for FPV lovers. Why? Because it performs great and comes with a complete FPV package with a built-in LCD monitor. There’s a reason why it is one of the top choices among enthusiasts. H501S has an amazing performance and is great for practicing. An awesome entry-level FPV quad for everyone who never flew a drone before. Hubsan H501S is equipped with four powerful brushless motors. The drone’s specs are way above average, even for drones within the same budget. Maximum flight time is an amazing 20 minutes, powered by a 7.4V 2700mAh Li-Po Battery. Control range is 300 meters; don’t worry about losing it, Failsafe mode will enable the drone to return safely to you. Expect a good quality image from the built-in 1080p camera. It’s capable of recording video, taking photos and transmitting Live Video to the 4.3” LCD screen built-in on the remote controller (see image). The FPV transmission is done via 5.8Ghz frequency and is lag-free this drone was on our drone under 500$ list but now we moved it into 300$ budget drone. 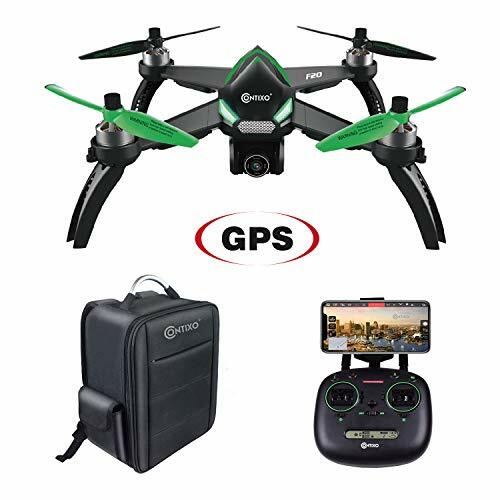 H501S packs a very interesting of useful and fun features, for example, GPS Positioning, Follow Me Mode, Failsafe Mode (drone returns home when it loses connection to the controller) and of course the more commonly functions of Headless Mode, Return to Home and Altitude Hold. "Ideal for intermediate to expert racers"
If you are serious about racing, but you don’t have much money to invest, then Eachine Wizard X220 is the drone you need to have a chance at competing in amateur drone races without spending too much money. Fast and serious. Expect a very fast yaw and responsive controls. Definitely not a drone for beginners or even intermediate skill expertise. Wizard X220 is equipped with a NAZE32 6DOF REV6 flight controller, not the most modern, of course, but a great entry point if you are just start racing. X220 uses 2 MN2204 KV2300 brushless motors. The control range varies depending on a wide variety of factors which we will discuss on another article. When it comes to flight time, X220 is powered by a 3S 11.1V 1500mah 25C XT60 battery that allows up to 12 minutes of flight time. To race FPV you will of course need a camera, and nothing better to get started then a 700TVL Camera. Keep an eye on the track by displaying the real-time video on an FPV monitor or FPV Goggles. Being a racing drone it does not pack any features besides proper hardware for racing. Besides the already mentioned brushless motors it also features 4 Eachine 20A BLHELI_S ESCs that make the quad very responsive to commands. "Ideal for beginners, crash friendly!" Most likely you have already seen or read about Parrot AR Drone 2 before. It’s not a new product and has been available in the market for quite some time. To this day remains one of the best drones under $300 (sometimes even under $200 if you are lucky and catch it on sale). Performs amazingly well, as expected from any Parrot aircraft. It’s great for beginners thanks to its stability and protective cover foam around the propellers and motors. The drone does not come with a remote controller. Instead, it makes use of the pilot’s smartphone or tablet device to function as a remote via WiFi connection. Powered by a 1500mAh lipo battery, AR Drone 2.0 has a flight time of 12 minutes, which is surprisingly good considering how large and heavy the quad is. In terms of control range, it’s too short, only 50 meters. The Parrot AR Drone 2.0 camera has slightly above average image quality, and indeed can provide good quality aerial video and photos. The built-in (onboard) camera has 720p resolution and can transmit Live Video via Wifi to the pilot’s smartphone screen through a free app. Besides the Live Video, app control and 3D Flip this drone presents no other features. So why is it on our list? Because the drone’s quality~price ratio is still way better than most common drones within this budget. Yes. Most drones on our list have a very steady hover and responsive controls. Throughout the article we will specify which drones are better suited for beginners and which ones are not. Just keep in mind that racing drones are not suitable for first-time flights, even if they are easy to control they do require some previous level of expertise. If you are a first-time rookie stick to beginner-friendly quads. It depends. There are drones which can be flown both indoor and outdoor, while others are specific to one type of flying only. Don’t worry, when discussing each we will mention if they can be flown indoor, outdoor or both. No. A great drone for a kid must have a protective frame around the propellers and the motor, a very steady hover, responsive control, plastic frame and be very lightweight and simple. If you want to buy a drone for your kid we would refer you to our Top 10 Drones Under $100 list instead. Some of the drones on our list indeed are capable of carrying GoPro, Xiaomi and SJCam action cameras. Mainly the larger drones featuring brushless motors. When we review a drone capable of doing so, we will mention in it on the “camera” and “features” section. Are there drones under $300 featuring a complete FPV package? Yes! We have reviewed amazing drones that include everything you need to fly FPV right out of the box, including LCD monitor and FPV Goggles! The Parrot Bebop 2 is our recommmended FPV pick. Before you go, let's recap the top drones under 300 dollars for 2019, ranked in order. Some may be asking why we didn't include any DJI drones in our list. Well, these popular drones are slightly above the $300 price range, but you can find the popular DJI Phantom and Mavic in our drones under $500 and drones under $1000 reviews. Don’t forget to share Best Drones Under 300 dollars with your drone enthusiast friends on Facebook and leave a comment down below! Have fun and Happy flying! I want to buy a drone under 500$ and have a payload capacity of 1 kg. is there anyone with that specs?